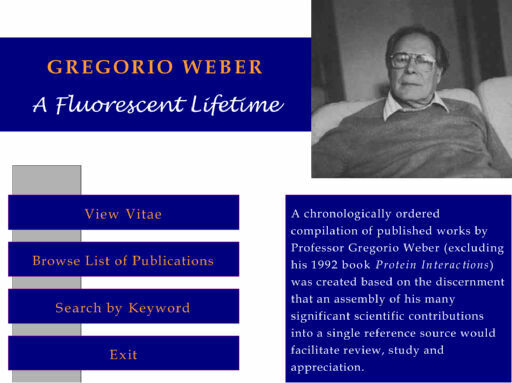 Born Digital Records from the Gregorio Weber Papers: Biographical Information, contain the curriculum vitae of Gregorio Weber, Professor of Biochemistry and Biophysics (1962-86), and a chronologically ordered compilation of his published work. Digital materials were produced by Edward and Virginia Voss in a CD-ROM entitled "Gregorio Weber: A Fluorescent Lifetime". The Gregorio Weber Papers: Biographical Information (Born Digital Records), 1948-2000 are managed by the University of Illinois Archives and do not feature precise descriptive information for each item. Discover their contents by browsing the folders and files. For more information, contact an archivist at illiarch@illinois.edu.